You VOTED – They did ALL the WINNING: Meet Your 2015 ROCKERS OF THE YEAR! Our most strangely named category for sure, but we hope the winner bears their ‘other’ title with pride. This was basically a catch-all category for people to vote for their favourite Rockers person of 2015 who *isn’t* a player or official. Media types (announcers, photographers, etc) as well as the league’s amazing bench crews picked up the votes here. Some of the more left field selections included our confused fanzine (un-)advertiser Mr Séamus and, for some reason, Croydon Roller Derby’s Agent Cooper. Once all the votes were totted up, aces team photographer John Hesse took second place, but a victory for Brighton’s awesomesauce A-team bench coach was never really in doubt. This category was open to referees and NSOs, and it’s perhaps testament to how few officials Brighton really have (clue: they need more, please get in touch with the league if you’re interested) that this award had less names put forward by voters than any other. Indeed almost 75% of the votes cast were split between just two candidates. Said votes were very closely divided, with the contest between head ref LaserHammer and his sidekick (?) Noise going to the latter by a single vote. Results haven’t really gone the Rockers’ way this year, either on an A-team or [huge win in Southampton aside] B-team level, but there is much to celebrate in terms of league development. Most specifically, this summer saw the largest graduation of Fresh Meat in the league’s history with around two dozen skaters passing their minimum skills. Many of these were thrown straight into the lion’s den of the burgeoning new B-team, a valuable stepping stone for this new generation of potential Rockers stars. The likes of Sutherland, Mighty Mouse and Feisty McGee scored highly in this ‘newbies’ category, but super swift Gonzalex jammed in more than twice as many votes as her nearest rival, leaving her team mates (like her opponents on track) trailing far behind. This was probably the most hardly fought category of all, with a mixture of A/B-crossovers, B-team regulars and newer additions all in the running for the award. There were a dozen nominees in total and more than half of these picked up several votes. Eventually, it came down to a three way tussle between Lab Wrath, Irish Mist and Bionic Betty, with the latter – a blocking superstar in the making – taking the win by a narrow margin. We’ll be honest; we weren’t entirely sure what the category of ‘Icon Of The Year’ really meant when we put it on the ballot paper. “The most inspiring Rocker on or off track” was the advice on the form, and this category saw votes for more different people than any other. Well over a dozen names were put forward. The likes of Dr Whooligan and Racey scored well, but this ended up as a two-way battle between folk who actually spent most of the year on the other side of the world. Maybe a true icon is as noticeable by their absence as their presence? Either way, whirling dervish Sham triumphed here with one vote more than the much-missed Bash. Many names were put forward here, with the likes of Hyde N Shriek, Sham, Bash and Bionic Betty [the three main player awards aren’t necessarily A-team specific] all picking up multiple votes. The result wasn’t much in doubt though. 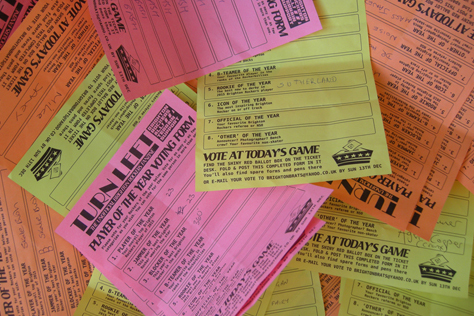 In fact it was clear after we’d counted just one of the four different dayglo colours of voting slips; yeah, we counted them colour by colour, we’re a bit OCD like that. In fact, pack warrior Hairy picked up as many votes here as the five next highest scorers combined. She is also (SPOILER ALERT) the only winner from our 2014 awards to retain their crown. Can she make it three in a row in 2016? Never bet against this amazing defensive powerhouse. This and our final category (Player of the Year) each saw votes for around ten different people, but in both categories around 70% of the votes cast were split between the same duo. It’s no exaggeration to say that Skate Bush has had probably the fastest rise from rookie to A-team superstar of anyone in the Rockers organisation since the league’s earliest days. She made her home debut in a mixed opener in February, before being instantly propelled into the All-Stars for their super tough British Champs season. Totally un-intimidated she quickly made a name for herself both in the packs and the star. It’s in the latter that she’s made the most impact with the viewing (and voting) public, and the relatively new Rocker takes this well deserved top jammer award. 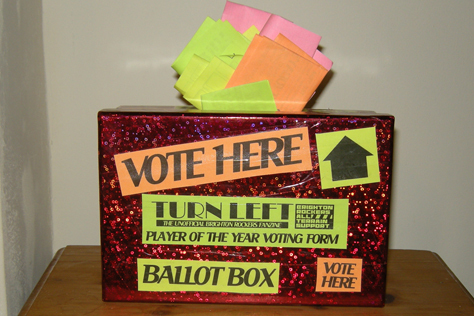 As we mentioned above, the final two official awards – the ‘top’ awards we suppose (although the British Union of Blockers will argue theirs deserves equal billing with the jammer one) – were both closely run things between the same two players. Our 2014 Player Of The Year Dr Whooligan came third in this year’s contest. She was the only Rockers player to feature in the 2015 British Champs top tens (appearing in all three of the Tier 2 best jammer tables) so the two players who polled higher must have had super special seasons, as indeed they did. Skate Bush takes second place here to the Rockers almighty captain, Gin Atomic. Super tough and feisty in the star and twice so in the packs, Gin’s ‘never say die’ attitude has been a constant positive on track in what has been a tough year (results wise) for the Brighton All-Stars. Her benching and coaching of the B-team has also gained plaudits all round. It’s no surprise to learn that the summer of 2014 transfer from Croydon also won the Rockers’ own top award for the year. Given that our voters also gave gongs to her housemates Noise and Sham, we can only hope that said household has a suitably spacious trophy cabinet to hold the fruits of their awesomeness. 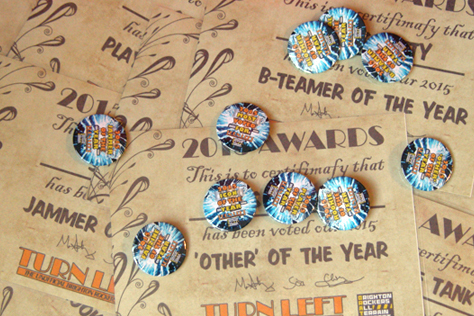 Our voting form only included eight categories, but when it came time to order the winners’ badges we realised there was a minimum order of ten. So we’ve randomly invented another couple of categories. Firstly, one for the person who accrued the most votes in total. Although she didn’t win an award (coming close in B-Teamer) this skater picked up votes in *every* category, suggesting that she’s either multi-skilled or had some very big fans in the crowd on the day of the poll. For picking up more votes in total than anyone else, we award MOST VOTED FOR: LAB WRATH. If friends of LW voting for her in every category seems a bit shameless, that’s nothing compared to our own shamelessness when it comes to the second additional award. 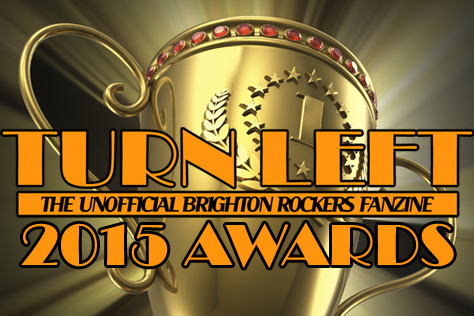 Yes, the 2015 Turn Left Awards proudly awards FANZINE OF THE YEAR: TURN LEFT. It’s a Christmas miracle! Heck, we paid eight quid for the badges – the least we deserve is to get one ourselves, right? No? Ah, whatever. HOW CAN I WIN ONE OF THESE AWARDS? If you’re a member of the Brighton Rockers then be even more awesome in 2016 and hopefully the crowd will recognise that aceness when it comes to next year’s vote. If you’re not a member of the Brighton Rockers (but play derby) then ask about a transfer, yeah? If you’re not a roller derbyer, but are based in/near Brighton, female and aged 18+, then drop an email to info@brightonrockers.com to ask about their 2016 Fresh Meat intake. The programme begins on Sunday 17th January, with the final taster/tryout day next Monday (4th). Book your place now and who knows, this time next year it could be YOU staring bemusedly at a badly printed award certificate. (Loads of 2015 nominees and at least one winner only took up the sport at the start of this year.) And if you don’t want to skate or you have a stray Y chromosome – but you’re still desperate for a 2016 winners’ badge to impress your friends – then get your name in the pot for the ‘Other’ or Official categories by talking to the Rockers about opportunities in NSOing, announcing and much more. Cheerses and Merry New Year.